The 2002 Trailblazer has approximately 167k miles on it. In general, this truck runs great especially on the highway. It idles around 610 rpm consistently. Work performed in the last year includes: new plugs, new coils, MAP sensor, fuel filter, throttle body was cleaned twice and new gasket, air filter, camshaft position sensor, variable valve timing solenoid, battery, fan clutch, water pump, thermostat, transmission flush and filter. About 3 years ago (approx 42K) the upstream and downstream O2 sensors were replaced and a remanufactured Jasper transmission was installed. Problem 1: Sometimes after it is warmed up, when I come to a stop, the idle drops but it usually catches itself. Occasionally it will stall. I notice this more when I go from drive to reverse to back into my driveway. Problem 2: Within the past month or so, I am smelling gas fumes. Problem 3: I am noticing it cranking a little more to start. I inspected for vacuum leaks to no avail. I did check my fuel pressure and it was within spec 48-54 psi. The fuel pressure regulator has a hose connected to the air resonator. I do not notice any vacuum from this port. My understanding of the fuel pressure regulator function is at idle there should be more vacuum applied to the regulator so that the diaphragm allows less restriction for return. When I manually apply vacuum to the regulator, the measured fuel pressure drops so I assume the fuel pressure regulator is working properly even though there is no noticeable vacuum applied. The CEL is not active with any codes. I am hoping these are all related to the same fix. 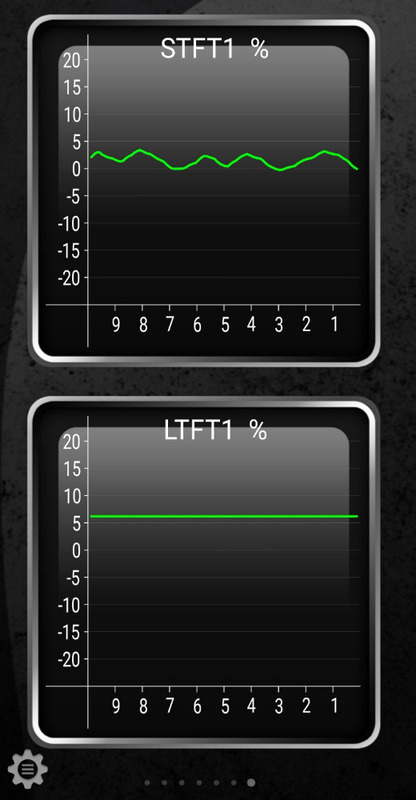 Attached are some screen shots I gathered from Torque Pro. Any help would be greatly appreciated. Last edit: 11 Sep 2018 11:58 by frankiep77. frankiep77 wrote: The fuel pressure regulator has a hose connected to the air resonator. I do not notice any vacuum from this port................My understanding of the fuel pressure regulator function is at idle there should be more vacuum applied to the regulator so that the diaphragm allows less restriction for return. When I manually apply vacuum to the regulator, the measured fuel pressure drops so I assume the fuel pressure regulator is working properly even though there is no noticeable vacuum applied. Make sure the hose is connected to a vacuum source. Last edit: 13 Sep 2018 20:03 by pole71. 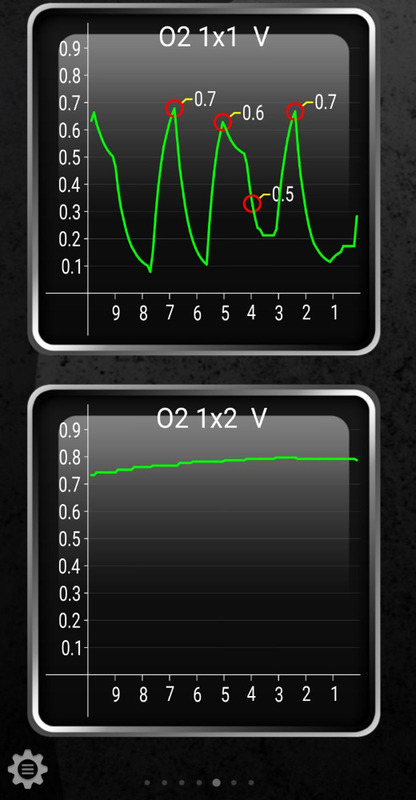 At a quick glimps your O2s are working. 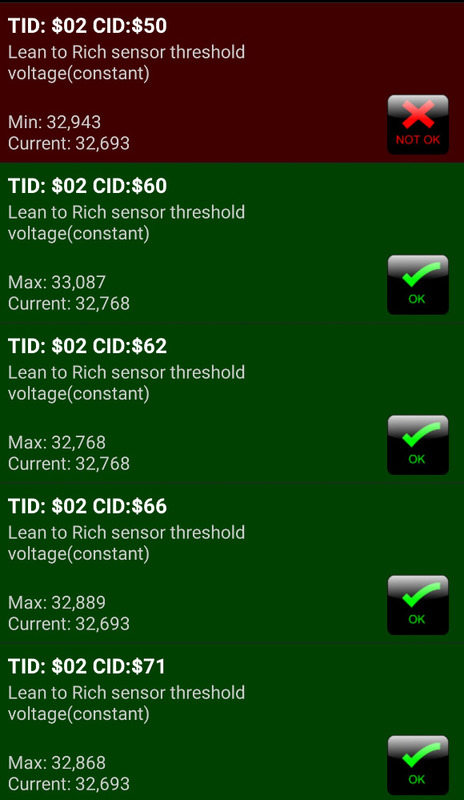 Sensor 2 should be a constant voltage at idle above .7v or over 700mv. Little less can be had without issues, such as 600mv but less than that and you possibly run into cat performance issues. you will see sensor 2 dance around when your on and off the throttle. Sensor 1 should switch from around .1 or 100mv to .8 or 800mv. The high and low point is different from one sensor to another. Some will go as low as 10mv and as high as 950mv. Some will go as low as 150mv to 780mv. All depends on the sensor, the manufacture and other variables we won't know. As long as its switching from low to high usually indicates a functional sensor. There are variables to that such as the sensor switching to slow. Those fuel trims look good too if those are at idle. Looks like its adding from 6-10% fuel. I usually like seeing less than 6% total but they say 10% and under is OK. Some PCMs won't trigger fuel trim related codes until they reach 30%! Is there only 1 upstream sensor on these engines? Last edit: 13 Sep 2018 20:13 by graywave. Wondering if these are related. Maybe do a visual inspection on the fuel tank and lines, if you haven't already. If you've still got the fuel pressure tester available, maybe watch the key off pressure after idling? Looking for an excessive rate of drop. ALL systems will depressurize after long enough, but a leaking check valve will be evident. That'd account for the long-er crank time. Did these tests fail, or have yet to run? 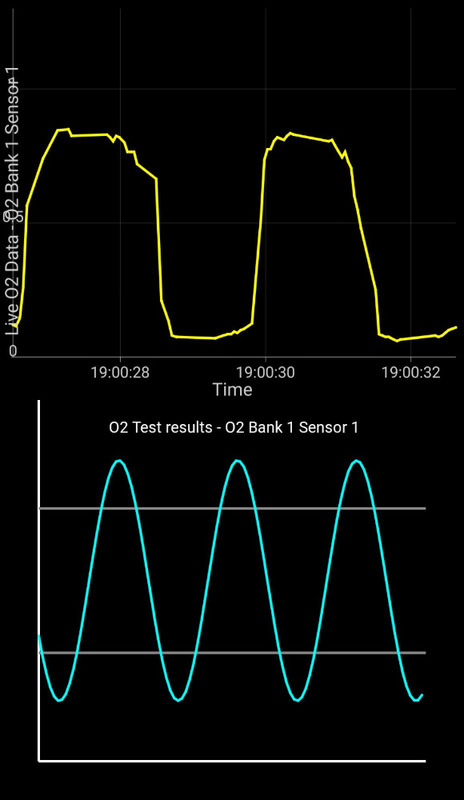 Does the O2 Sensor monitor show complete? "Make sure the hose is connected to a vacuum source. " I was thinking the same thing but this is the original design. Shouldn't there be vacuum at this port on the resonator at idle? Last edit: 14 Sep 2018 14:32 by frankiep77. 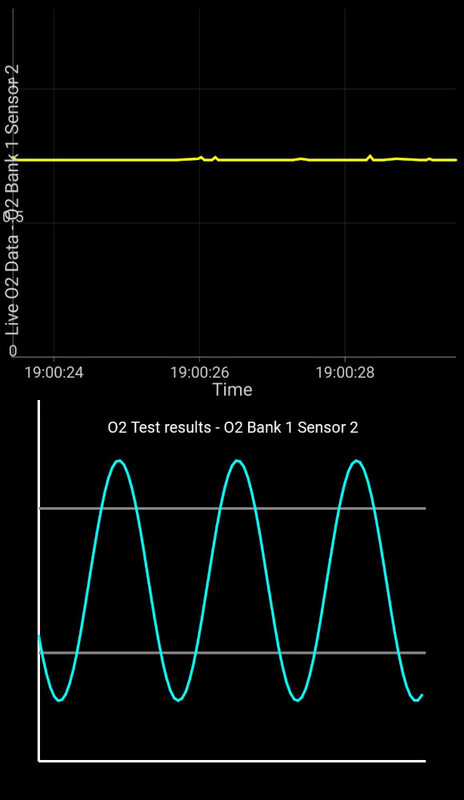 graywave wrote: At a quick glimps your O2s are working. 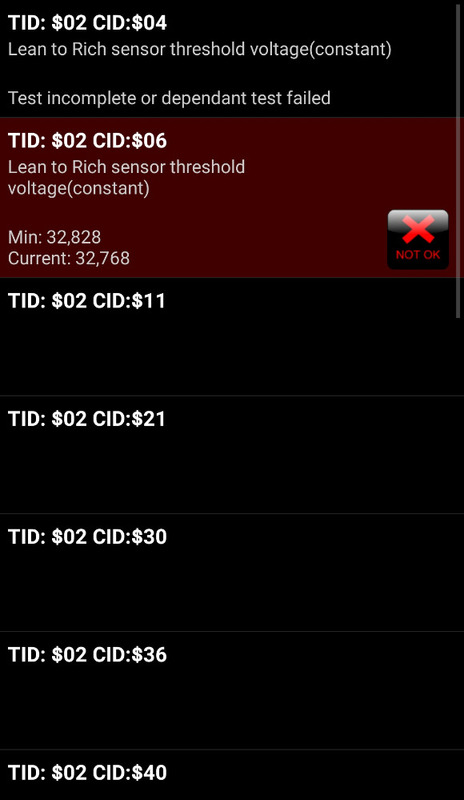 Sensor 2 should be a constant voltage at idle above .7v or over 700mv. Little less can be had without issues, such as 600mv but less than that and you possibly run into cat performance issues. Yes, I believe those perfect blue sine waves are an example that Torque Pro gives for comparison to the actual. A better scan tool with faster response time might produce smoother results but these provide the general idea. This engine is an inline 6 with only one upstream sensor. Attached are screenshots I took today at idle. Still learning how to use this Torgue Pro App but the graphs are pretty consistent with what I submitted previously. I wasn't sure if those were taken at idle. I will crawl under this weekend and give another visual as I retest the pressure looking for the excessive rate of drop as you suggested. Attached are the screenshots of the test results. The TID descriptions in Torque are wrong. 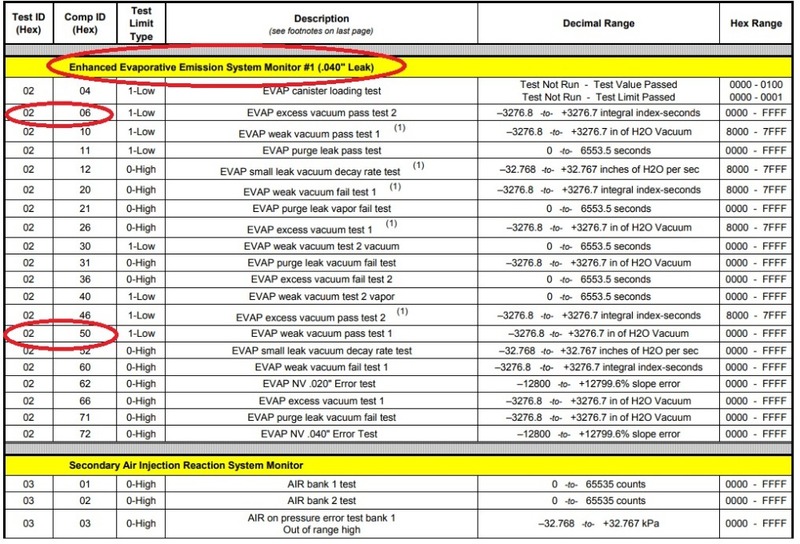 Those failed EVAP tests now make perfect sense when talking about a fuel smell. No offense meant here, but this is why I hate Torque. The time and advice all have given is greatly appreciated and as soon as I get a little spare time to crawl back under I will update my findings. As far as the fuel smell and the occasional idle drop. I don't think these are related because the fuel smell is relatively recent where as the idle issue has been happening for quite some time. If I recall, it started happening around the same time the re-manufactured transmission was installed but this could be coincidence. I took the Trailblazer on about a 2.5 hour road trip last weekend (5 hr round trip). Highway driving speeds ranged from 60-80 mph. The truck runs without issue on the highway. I did notice transmission fluid temps via Torque Pro to be 20 to 30 degrees higher than the coolant temps which were around 197-205 degrees while cruising. So I had a few minutes to crawl under last night and grab some fuel pressure readings. Attached is a graph of the fuel pressure vs. time after shutdown. It loses about 4 psi over the first 8 minutes then has a much steeper decline over the next 16 minutes. How long should the pressure hold? Did you ever figure out the problem ? My 2002 trail blazer has the same codes, Trying to figure it out. Funny that you ask because just a few weeks ago, I finally figured out where the gas smell was coming from. I never seen wet spots under the vehicle and gas evaporates pretty quickly so I never seen any dripping. But after a recent fill-up, I noticed some damp residue on my gas tank as I was under the vehicle troubleshooting. Turns out the the lines on top of the fuel pump are notorious for rotting out. I dropped the tank and sure enough, the line had a small leak in it where it entered the top of the pump. I had the new pump on hand just in case so I swapped it out. Smell is now gone! Still troubleshooting the rpm drop issue. Recently my alternator failed so I thought that might have been the issue but after the new one was installed, I still have the same problem. The engine bogs down at idle when there is a severe power draw or when the power steering is stressed. I've cleaned the throttle body several times to no avail. I am wondering if I have a bad ground or the throttle body is just on it's way out. Occasionally I notice the rpm drop when coming to a stop also so could be vacuum related also.